Other changes also being proposed are enlarging class sizes and cutting back on various class activities. 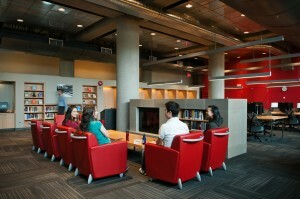 The refurbished main floor at Koerner Library. Photo credit: Martin Dee. The transformation of UBC Library is examined in a feature article in the Ubyssey. The article, entitled “Turning a Page: the changing role of the university library,” examines issues including electronic resources, digitization, collections management, space and budgetary issues, and more. Interview subjects include David Farrar, UBC’s Provost and Vice President Academic; Ingrid Parent, University Librarian; Jo Anne Newyear Ramirez, Associate University Librarian, Collections Management; and Allan Bell, Director of Library Digital Initiatives. Read the results of three public meetings hosted by the VSB surveying public opinion of the future of Vancouver Schools. From The Vancouver Sun: Read BCTF president Susan Lambert’s letter to B.C. Principals’ and Vice-Principals’ Association‘s president Jameel Aziz regarding the teachers’ labour dispute in B.C.